Eventually, after the ship had sailed for some time up and down outside the port, she was piloted in by means of the pilot boat. The Leonidas passed up the harbour, passed Vagadaci, and when off Waitovu through some stupidity touched the reef, but with the riding tide floated off and dropped anchor in Waitovu passage, or as far away from the shore as she could be conveniently anchored without touching the outer reef. So soon as communication was made with the ship, it was ascertained that cholera had been on board together with smallpox, and that II coolies had died of cholera arid six of dysentery; cholera seeming to predominate, while little seems to be known of smallpox. Every precaution, under the unfortunate circumstances of the case, appears to have been adopted by the Government. 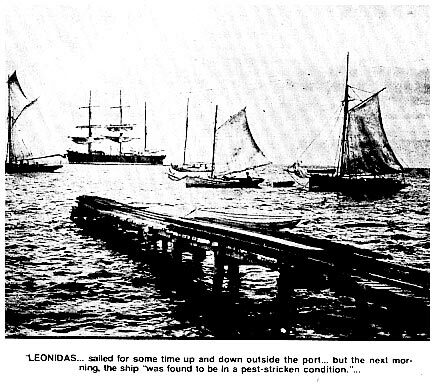 A cordon of four police boats has been arranged at suitable distances round the Leonidas, and the schooner Elizabeth (lately the Samoan navy) has been sailed down from Nasova and anchored off Waitovu, as relieving, or guard ship, that the boats’ crews may be relieved every four hours. Dr McGregor (the Chief Medical Officer of the Colony) has devised a very ingenious method of effectually preventing the contagion being conveyed to the shore, during the process of sending stores, letters, etc, to the ship. A staging has been erected on the outer reef, with a moving platform. Stores necessary to the ship are placed on this platform at low tide and taken off by the ship s boat. It is sincerely to be hoped that all officers of the Government will, under the trying and unfortunate circumstances, be at their post and duty, and that any and every assistance will be rendered by one and all to prevent any contagion reaching these shores.